Custom Imprinted Faarel Sunglasses are stunning promotional giveaways for parties and celebrations. All kinds of celebrations can be made exciting by bringing-in these custom fun sunglasses. Made of polycarbonate materials, these custom new arrival sunglasses are made efficient by providing UV protective lenses. They protect eyes from sun even in the hottest of weather conditions. Order these trendy folding eyewear right now to get free artwork, free online proofs and fastest turnaround time offers. 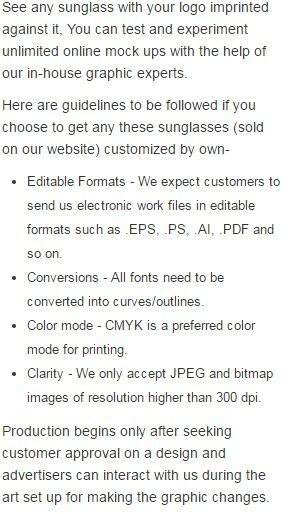 Request a quote to know wholesale savings for these Custom Imprinted Faarel Sunglasses. Additional Information: UV 400 protective lenses, Trendy folding eyewear.